Quikr has uncovered its real estate vertical QuikrHomes five months after announcing the plan. For this the company had appointed Favista co-founder Manish Sinha in April to head its real estate vertical. The launch in line with the company’s larger plan to have separate verticals for key segments such as real estate, cars, electronics, jobs and education. In its expansion drive, Quikr has recently launched its car portals named QuikrCars. 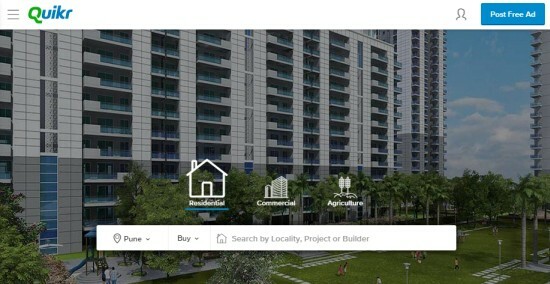 Quikr claims to have 200,000 transactions in since 2012 which has doubled its businessin the last three years.“With Indian real estate marketing moving online to capture a $20 billion market coupled with our cross category platform, we are uniquely positioned to capture the market share for our homes vertical,” said Manish Sinha, head of QuikrHomes. • Integration with insights on other transactional activities across the platform. Quikr had raised about INR900 crore in April from its leading investor Tiger Global, Swedish fund Kinnevik and hedge fund Steadview Capital Management. Other investors in the company include Omidyar Network, Matrix Partners, Nokia Growth Partners, Warburg Pincus, Norwest Ventures, and eBay Inc. The launch of QuikrHomes is part of Quikr’s larger plan to have separate verticals for key segments such as real estate, cars, electronics, jobs and education.